The fall season is just around the corner and it’s time to start preparation for it and that would be incomplete without the latest hair color trends. Hair are the important element when it comes to look beautiful and your beauty will be partial without good hair. To make everything easy for you so that you can rock your hair in the coming fall as well as winter season we bring for you the best hair color ideas. The most elegant, exceptional and stunning hair colors ideas are listed below for you to choose and look splendid this fall. Lately, the most unexpected trend that we came to observe is that many famous actresses are showing their natural hair colors and that happen to be is the beautiful black color. Following this many people started dying their hair in black and the plus point is that they suits on every skin type. The latest hair color that is trending for this fall season is the rosy golden. Lately it is seen on Hilary Duff, Elle Fanning and Kylie Jenner; this color is different from the usual pink hair dye and the slight pang of platinum in it makes it more unique. This fall brings some wonderful changes for usual gold hair color. The other color that complements the golden perfectly is none other than the silver. They are like best friends where the hints of silver in the hair increase the beauty of golden. Something other than the blonde for your hair in this fall season is the lush chocolate brown hair color. This gorgeous and stunning color is the all time favorite and suits on all type of skin color especially in fall and winters. This beautiful and drop dead gorgeous burgundy color is the most ravishing choice for your hair in this fall season. The shade of plum contrasting with the bluish black hair sets the major hair color goals for this season. This fall season brings the amazing color ideas to try out on your hair. On the darker shades here is an amazing shade of deep red wine that gives you the passionate yet charming look. This is definitely to go for as nothing looks better on warm cozy afternoons than this color on your hair. There is not only one shade of red for you to rock this fall instead here is another amazing option to go for. The latest trend of hair color brings reddish shade of terra-cotta into spotlight. This color gives you the most vibrant and lively look to carry this fall. Brown will never look boring when this new shade will mix up with it. The little strokes of cinnamon shade on the natural dark brown hair are all you need for bringing life back to your usual hair. No doubt, this color is already giving the warm feeling. Another most unusual color that is trending for this fall is grey. When other colors bring vibrant looks this color leads toward the most sophisticated look to carry out this fall. This grey color will look better on long hair. If you are a fan of blonde but still want to try something unique and new than this latest trend is definitely for you. The Elsa from frozen, inspirational hair color is an exceptional color idea for your new fall look. One of the most exciting and electrifying hair color trend for this fall is the gorgeous smoky blue. This color id is completely different from the regular blue hair color and gives you the dazzling look. The elegant and graceful feeling this pretty shade of pink brings, definitely makes it irresistible. The shade of violet along with pink makes it more appealing and attractive and carry the welcoming look of spring. The most classical look for your hair in the fall and winter season is the Emma Stone’s ginger colored hair. This color is enough to bring you the warm feeling in the coldness of snow and will suits best on pale skin tone. 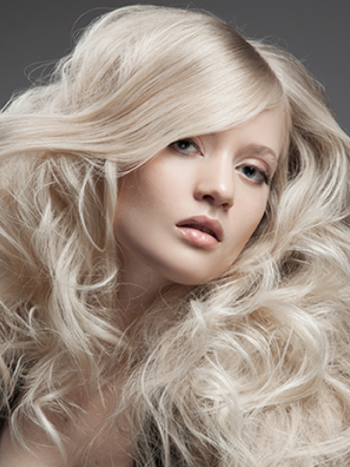 If you are a fan of blonde hair color than here is an amazing idea for you to carry out this fall. The strawberry blonde hair color is totally in and as always gives you the feeling of warmth in the chillness. From darker towards lighter tones this hair color is perfectly best for this season. Once again for all blonde lovers who want to try something different with their favorite? The combination of brown and honey is another great option to for this fall season. The brown at roots that turn lighter shade like honey at the tips is simply perfect. Bronde is the all time favorite for carrying out your blonde look as well as mix it with brown for an exceptional look. This combination of blonde and brown never gets old and it is best for the fall and winter seasons as it goes very well all the time.